Andhra Pradesh is situated on the south eastern coast of India and is the eighth largest state in India. Hyderabad is the capital of both Andhra Pradesh as well as Telangana but it remains the de jure capital for Andhra Pradesh. The state is planning to make Amravati its new capital. It is a beautiful state which is rich in culture and heritage. There are beautiful palaces, museums, beaches in the state. Andhra Pradesh has varied topography. It is bordered by Telangana, Orissa and Chhattisgarh in north , Bay of Bengal in east, Tamil Nadu in south and Karnataka in west. It has the second largest coastline in India. It also has two important rivers flowing through it, Godavari and Krishna. Andhra Pradesh has often been called the food bowl of the south. Climate of Andhra Pradesh can be referred to as tropical. There are three main seasons in the state i.e. monsoon, summer and winter and there is also short spring season. There is little or no discrepancy in weather in different areas of the state since the state is close to rivers, seas and hills. Moderate climate is experienced in the plateau region in comparison to the coastal belt and low valleys. Summer season starts from March and continues up to mid June that allows the temperature to increase up to 42 degree maximum. In various regions, variation in maximum temperature is from 23°C to 28°C and a variation can be seen in minimum ranges from 10°C to 12°C. Hot summers are experienced in coastal plains, and at times, temperature reaches at 42 degree centigrade at some places. Temperate climate is enjoyed by plateau residents where cool summers and cold winters are experienced. A degree of relief can be enjoyed when pre-monsoon showers hit state somewhere around the middle of June, but only drawback of this time is that there is a rise in humidity. Monsoon arrive in the state in the month of July and stays till September but sometimes in October, November and December, heavy rainfall can be experienced. Southwest monsoon winds offer maximum rainfall at times reaching up to 55 inches maximum. In regions closer to coast, rainfall is heavy but in northern and western plateau regions, meager rainfall is observed. During October and November, heavy rainfall occurs due to north east monsoon winds. From October till February, winter season is experienced by state and this time of year is quite enjoyable and pleasant. Mild winters are enjoyed, and temperature does not go below 16 degree. This is the perfect time to visit this beautiful state. 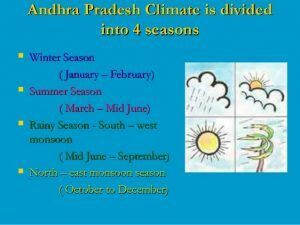 In Andhra Pradesh, summer season lasts from March till June. Level of moisture is quite high during this time. Summer temperatures in coastal plains’ region are higher in comparison to the remaining state. Temperature during summer months oscillates between 20 degree centigrade and 40 degree centigrade. In some places, temperatures rise to about 45 degree on a sunny day. Tropical rains occur in the state of Andhra Pradesh during months of July till September. Heavy rainfall is experienced during this time. The total rainfall’s one third is received through North eastern monsoons. In mid June, pre monsoon showers hit state bringing a relief from the scorching heat but at the same time humidity increases. From July till September, monsoon season continues, but from October to December, heavy downpour is experienced. For maximum rains in the state, southwest monsoon winds is considered to be responsible. In the region located close to coast, heavy rainfall occurs in comparison to plateau regions, especially in west and north regions getting lesser rainfall. Heavy showers are experienced in October and November months, in coastal regions. From October to February, state experiences winter season. Since there is a vast expanse of the coastal belt in this state, winters are not too excruciating. A very short spring season also occurs in March and April. During this season, new leaves are sprouted by dry tree or plant branches and the whole atmosphere looks colorful and vibrant. Similarly, New Year is signified by Ugadi, and this is time when one must let bygones be bygones and look forward to an exciting and glorious beginning. Based on the climate parameters i.e., rainfall and temperature, the State is broadly divided into 9 distinct Agro-Climatic Zones. The agriculture planning for each zone is supported with the research and recommendations of a Regional Agriculture Research Station of ANGRAU set up within the particular zone. In an attempt to plan the agricultural operations in much more focused way, these 9 agro climatic zones have been divided into 322 farming situations, which are unique in terms of microenvironment and need specific practices under each situation. Climate change has adverse effects on whole of India and Andhra is no different when comes to climate change. As state is adversely effected by the climate change. Due to coastal area and agricultural economy , state has large impact of climate change. Cyclones also hit the state aggravating the conditions of the state. Major Climate Change issues for the State arise in the agriculture sector and for the long coastline. Agriculture is severely affected by variability in rainfall and temperature patterns, while rising sea levels and extreme events of marine origin, such as cyclones pose problems for the coastal areas. Besides these, other critical areas of concern are food security, increasing number of climate vulnerable habitats (like slums or village dwellings) and climate vulnerable infrastructure (like roads and bridges which may be washed away by floods). The State Action Plan for Climate Change(SAPCC) has been designed around the existing policies of the State Government by taking into consideration ongoing programmes and schemes being implemented at the State level, as well as the National Action Plan for Climate Change(NAPCC). Engineering new and innovative policies/mechanisms to promote sustainable development. The strategy is focused around supporting the objective of the Central Government on NAPCC, inclusive growth and ensuring economic sustainability for the long term. Actions would be undertaken which deliver benefits for growth and development, while mitigating climate change and ensuring ecological sustainability. Initiate process to mobilize significant investments. An estimation of additional resource requirements and exploration of existing and new carbon finance potential has to be carried out. Mobilize people/institutions to work towards integrated solutions. This would involve building broader stakeholder engagement to widen perspectives and involvement in implementation. Considering governance and institutional contexts, appropriate institutional arrangements and building capacities have to be ensured, keeping in view the coordination between departments, stakeholders and integration with regular planning and budgetary processes. Harness the wealth of expertise and knowledge already available in the State and the country on climate change. Investment in knowledge and research is essential to reduce climate related uncertainty and improve knowledge about appropriate responses. Contribute towards developing the State. State specific issues have to be considered and prioritized while creating appropriate enabling environment for implementation of NAPCC at State level. Success and sustainability of the investments are of critical importance. All of the thrusts of Andhra Pradesh’s development framework show vulnerabilities to climate change. Adaptive measures will be necessary to ensure their long term resilience and sustainability in the face of climate change. In order to effectively align Andhra Pradesh’s developmental objectives with the sustainability agenda, this strategic action plan aggregates findings across sectors, and addresses them in an integrated manner which reflects the national priorities articulated through the NAPCC.